I will create 1000 LOW OBL with max 150 comments/backlinks per page. 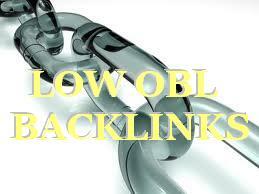 TOP QUALITY backlinks from the best blogs with low OBL! VERY LOW OBL means that these pages are not full of comments, but high quality posts. Because of this quality you will get LINK JUICE for LONG TIME! I will also over-deliver and provide a full report file ! create 1000 Low OBL blog comments is ranked 5 out of 5. Based on 11 user reviews.